We’re finding that the students are not familiar with a lot of themes in the literature they read (after all they are only 10 and 11 years old), so we’ve been trying to support them by guiding their thinking as we discuss texts together. They don’t realize as easily as we do that themes can be things like: courage, honesty, standing up for what you believe in, fighting against peer pressure, survival, the power of friendship, believing that everyone has strengths and weaknesses, and so on. The more experiences we give them with interactive read alouds, allowing time to negotiate the deeper meanings of texts together, the greater the chance that they will be able to do this on their own. Basically, it’s just another way of scaffolding their thinking processes. I wanted to begin with an easy theme to spot, so I told the students that a very popular theme in books is the idea of ‘good vs. evil.’ Some students quickly suggested books like the Harry Potter series and Lightning Thief. From there we talked about Fairy Tales and how the characters in them are often so clearly all good or all bad. 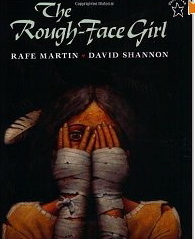 As we wondered why ‘good vs. evil’ is such a popular theme and has been around for centuries, I shared with them what I learned from reading the note in the front cover of Rough Face Girl. The note suggests that humans have always craved justice. We like to see good get rewarded and evil punished. After a fun read aloud (I love doing the voices of the characters in different ways) the students talked with partners about the evidence supporting the theme of ‘good vs evil’ as well as ideas comparing this book to the Cinderella tale. They were interested to learn that there are 1500 versions of Cinderella. Next week I’ll read Mufaro’s Beautiful Daughters (another Cinderella tale from Africa) and our conversation will continue. Here are a few questions for you to ponder: What picture book do you enjoy reading to kids that has some sort of theme or underlying message? How do you support students in learning about themes? What sort of lessons are you doing in primary grades related to ‘reading deeply’? We welcome your comments. Also, Katie and I talk more about inferring (it’s not just about identifying themes) in Chapter 9 of Catching Readers Before They Fall. We also did a video webcast for the Reading Recovery website. You can view our presentation slides and link to the video webcast here.